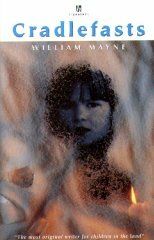 This is the second book in William Mayne's time travel trilogy. As a matter of interest, it was written nearly thirty years after the first volume. I wouldn't have guessed that from the text though. I just looked at the dates. Cradlefasts is a seamless continuance of the story begun in Earthfasts. You must read them in order. In fact, I'm not quite sure how much actual time travel there is in this book, though Nellie Jack John is still roaming the hills round Swang looking for a way back to his own time. Will he, won't he? There's a bit of a clue in this book. The main focus of Cradlefasts is a poor, broken seven year old girl who has a young and inadequate mother. From a chance meeting at the bowling alley many things flow. David, still disturbed from his time travel experiences the previous year and emotionally unstable from the death of his mother and baby sister years ago, fixes on the child. He speculates that she may, somehow, be his sister. The notion is fuelled by the inescapable fact that the child, Donna Clare, is in possession of a fluffy toy that David had left at the hospital for his mother to give to his baby sister when she was born. It's all quite hard to follow. Did Donna Clare's mother, Billy, swap babies in the maternity ward? Did she simply steal Muz (the toy) from David's dead sister? How and why did Muz find his way into Keith's coat pocket? You may have to check back to the original meeting at the bowling alley to see why Billy may have thought that Keith was Davy.